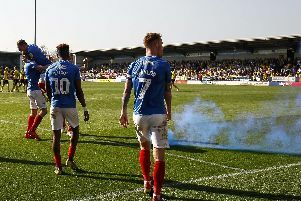 Joe Gallen is expecting Gillingham to raise their game at Pompey – regardless of the Fratton Park crowd size. The Blues start their Checkatrade Trophy campaign against Steve Lovell’s side tonight (7.45pm). The competition is much-maligned by the majority of the Fratton faithful, with many choosing to boycott the games in protest. Last season, crowds for group-stage matches against Fulham under-21s and Crawley were barely more than 1,500 apiece. Nevertheless, it’s a game Gallen insists Pompey are taking seriously. And although he’s unsure if the Gills will ring the changes, the assistant manager believes it will be a good test for the Blues. ‘Any team coming to Fratton Park raise their game – in front of a huge crowd or in front of a small crowd,’ said Gallen. ‘Gillingham have got some good players and are a very established League One side. ‘Tom Eaves scores goals and has always been a handful for defences in League One and League Two. ‘(They have) Max Ehmer and Josh Parker – there is a list of recognisable players we are going to come up against. ‘Maybe they are going to make some changes, maybe they’re not going to make some changes. Who knows?